Swanton’s Aricka Lutz handles the ball as Addisyn Bentley of Fayette (5) defends during Monday’s game. The Bulldogs defeated the Eagles 50-32. Trista Fruchey of Fayette looks to score Monday versus Swanton. She finished with 13 points for the Eagles. 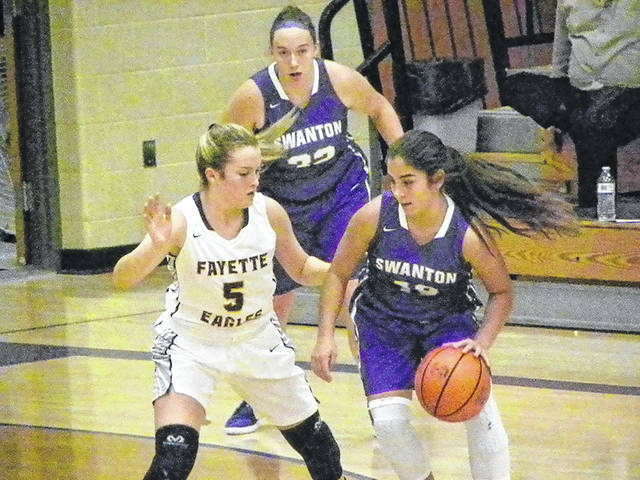 Swanton took advantage of Fayette’s cold-shooting night to beat the Eagles 50-32 in a non-league girls basketball game Monday night at the Eagle’s Nest in Fayette. The Bulldogs forced Fayette into 21 turnovers, plus the Eagles struggled through a 10 of 50 night shooting the basketball. Fayette hung around, and it wasn’t until a 9-2 run in the final period that Swanton had a comfortable lead. Most of the damage was done at the free throw line, where the Bulldogs made 6 of 12 shots in the run. Kara Truckor had a big triple in the middle of the run on a kickout from Bridget Harlett. “That came at a big time,” mentioned the Swanton coach. Fayette’s trouble shooting the ball lasted all night, but they managed to stay in the game most of the night. Down as many as 15 in the third period, they fought off an 0 of 10 start to the second half to get back in the game. Dakota Blosser and Addisyn Bentley closed the period with buckets to make the score 37-26 heading into the final period. The Eagles made just five shots in the first half, but did enough at the charity stripe to stay within striking distance. Trista Fruchey, who led Fayette with 13 points in the loss, was 4 of 6 at the line in the period, plus made both field goals for the Eagles as they pulled within 26-21 with 2:29 left in the half. Neither team closed the half strong. Swanton’s Morgan Pine scored with 1:41 left to close first half scoring. Swanton also committed 19 turnovers and finished 18 of 51 from the floor. The Bulldogs also won the rebounding battle 48-43. Averie Lutz knocked down three triples in the game and led Swanton with 15 points. Harlett added 11. Swanton (2-2) hosts Evergreen Thursday. The Bulldogs also have a schedule change. The game at Springfield on Saturday, Dec. 15 has been moved to Tuesday, Dec. 18. 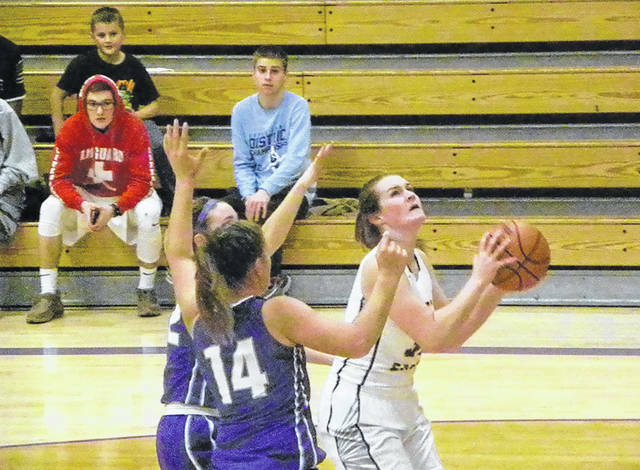 Fayette followed that with a game Tuesday at Edon in the Buckeye Border Conference and the Eagles fell 44-35. The Eagles trailed 29-16 at the half and attempted to cut into the lead, but could only get it to single digits by the end of the contest. Fayette (1-3, 1-1 BBC) hosts Montpelier Friday in BBC play.